The tomatoes are eager to get the party started. This is over 160 tomato plants, all growing so fast you can practically see them doing it. 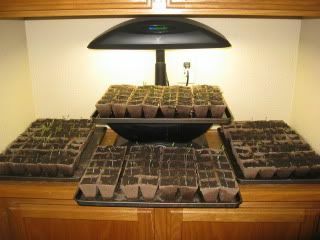 As you can see, I’m repurposing the Aerogarden for this – last year, just setting a tray along each side worked brilliantly, so I figured hey, why not use ALL SURFACES! And it’s working really, really well. Every morning, I rotate the trays so that they take turns with the light/shadow thing (the tray in front gets less light, the one directly under the lamps gets arguably too much of it) and which direction they’re leaning – they sprouted in record time and are making alarming progress toward being ready to transplant. That’s how we roll out here. These little tiny sprigs of green are roma tomatoes – a determinate, which I learned last year means all plants ready to harvest at the same time. According to the seed company, each of those plants should produce between 3 and 5 pounds of romas, all the same time – which should be around the first of May. According to our local master gardener, it won’t be unusual if they actually produce between 5 and 8 pounds per plant – we have ideal soil and growing conditions for them, apparently, and they tend to take off like gangbusters with very little encouragement. That’s anywhere from 480 to 1,280 pounds of tomatoes, all ripening up at once and expecting that I’ll, uh, do something with them. There are moments when the enormity of what you’ve bitten off really sort of comes to you, no? And when I pause to contemplate that this is nothing compared to what I’d have to do to actually feed this family, 100%, with homestead-grown food…I get a little dizzy. But of course, it’s also pretty exciting. Just on our slightly-bigger-than-average home lot, we have the capacity to grow half a ton of tomatoes! More, if we wanted to devote more of the yard to them – but we’re not, because at the same time we’re also growing peppers, golden beets, carrots, peas, cucumbers, spinach, lettuce, blackberries, raspberries, blueberries, cranberries, artichokes and green beans. You know, in this first cycle. There are three more, after this one. Seriously, though, it’s astonishing to think how much is possible for us. Our options are wider than we realize, limited only by the bonds we ourselves choose. Seems like every day, I look at some corner of the house and think, Waitasecond, we could… and some beautiful possibility erupts before my eyes. In a lot of ways, my homesteading thing is less about money and more about living a life that doesn’t worry about the stuff as much. It’s certainly no less work to attempt to produce at home what you’d normally just buy at a supermarket or mall; in fact, I’d say it’s more work, and dirtier work, and riskier work, too. Just because I plant it doesn’t mean it’ll grow; even if it grows, it doesn’t mean it will produce food; and even if it produces food, that doesn’t mean I’ll necessarily get any of it. You’d be amazed how hungry little tiny bugs can be, y’all. And let’s say I get all my tomatoes in and process them and line up the quart-sized Mason jars and can up a whole whack of sauce – that doesn’t mean I’m home free. If I mess up, get the acids wrong, have a faulty seal or improper storage temperatures, I may well pop open those bad boys a couple months later and be confronted by the unmistakable funk of spoiled tomatoes. But, it’s a start toward self-sufficiency. It’s bound to be full of mistakes and setbacks, and whining, and finding myself with a garage bursting with tomatoes that need to be dealt with NOW!, before they turn into fermented tomato yuck all over the garage floor. But I keep thinking about what it would be like to be able to have household labors provide for household needs. I imagine what it would be like to not have to use paycheck-money for food and clothing, but to use money we got from selling what we make right here in the Den for it. I think about how much better our lives could be, if we could do that. Not necessarily financially – we’d be taking away 65% of our net income if I stopped working for a paycheck, far more than we’d be saving because I was homestead .15 an acre for Pete’s sake – but emotionally. I hate to admit it (because I dislike responsibility – it’s so grown up and some junk), but I’m the center of the household. When I’m here, even if I’m working full time for a paycheck, things have a way of running right along. The kids are happy, they’re doing well in school, we spend less money and have a better lifestyle anyway. When I’m in an office somewhere else most of the time, things fall apart. Everybody gets cranky, the kids start acting like savages, I get pissy, which naturally leads to yet more feral behavior from everyone and pretty soon it’s like…Lord of the Flies around here. Weird, huh? You’d think that more money would be like oil on the water, but it’s not. There’s just no substitute for being there for your life, and living it in a way that pleases you. If you wake up in the morning excited about what lies ahead, life is good even if you have nothing. If you wake up dreading what you must endure to get through another day, well…life isn’t so good. As I look forward to paying off these debts and wrestling our monthly needs down to where one income can once again give us enough, plus a little bit extra…I know that making what I do here at home pay or save is going to be more and more important. After all, we’ve got four kids barreling toward teenage-hood, college…weddings…the demands on that paycheck aren’t going to get any smaller, not for a long, long time. If I don’t want to spend the next twenty years married to the BART system, I’m going to want to make this thing work. Love the idea of dragging the loom along on your commute. If you do it, make sure you have a spy camera set up somehow! Can you imagine the looks/comments? People give me strange looks just for knitting in public, but weaving would definitely raise the "freak factor" to a whole other level! As for your homesteading adventures, I can't believe how much you have crammed into (what sounds like) a very small space. One wonders what you could do with some real acreage. Perhaps feed the population of Ghana? It's something to contemplate! You were up posting very early this morning. On the train, I assume? 0.15 of an acre? I'd always assumed your property was bigger than that. Or is that just the size of the veggie garden? I completely understand your desire to progress towards self-sufficiency - it's mine, too. I just wish our growing season was a long and as productive as yours. giggling like crazy imagining you on the train with your loom. If you do do it, please take pictures of the other passengers faces! As a veteran of many huge bowls of tomatoes waiting to be taken care of, do remember that you can also freeze tomatoes. A quick dunk in boiling water, slip the skins off, put them in a ziplock bag, get as much air out as possible and in the freezer they go. Works great! Do you have a food mill? That works great for taking out the skins and seeds when you make sauces, too.